DC's massive blockbuster Blackest Night has almost reached it's dawn, and we all know every 'event' leaves a truckload of re-launches in it's wake. Moving some of the more popular 'rebirth' candidates aside, here are four often over-looked DC properties, that could do with finding a little spotlight when the Brightest Day breaks. DOCTOR FATE: This ones always puzzled me. Sure his (or her's) history has been a little convoluted at times, but this is DC - what characters hasn't? Dr Fate's adventures would add a lot of flavour to the mainstream DCU, plus it's one of the coolest costumes in comics! Do we really want to limit that to the pages of the JSA? UNCLE SAM AND THE FREEDOM FIGHTERS: The Ray, Uncle Sam, Phantom Lady, Miss America, The Human Bomb - this group has some freakin' cool characters, who could handle alot more than simply 'serving on a team'. With a cool bunch of powers and iconic costumes, it's like success in a jar! Sure a lot of them were butchered at the start of Infinite Crisis, but when has death ever kept a good concept down? (Don't answer that Tomorrow Woman). DIAL 'H' FOR HERO: Now here's a handy gadget, pick it up, dial H-E-R-O, and be transformed into a super-hero for a limited time. Throw in a shadow organisation or two after the dial, a union of former dial wielders (the switchboard?) and forget it - no other property can highlight the 'regular joes' of the DCU, like Dial 'H' for Hero. Plus, how cool would it be to see the dial used as a chair on the Justice League? Then 'real heroes' could find out what it's like to help in aid efforts, alongside the likes of Superman and Wonder Woman. THE BULLETEER: There's usually a bit of hesitation when it comes to other writers taking Grant Morrison's work for a spin, but this lady has to much going for her to stay in the chamber. Plus, while Alix Harrower swore off the whole super-hero gig at one point, the teacher of autistic children has shot back into action again, even as part as an interim JLA! 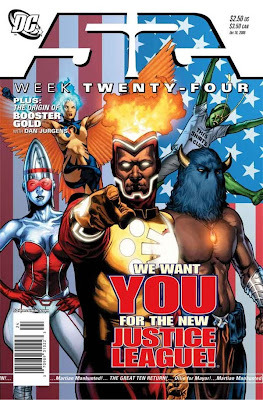 For those of you who didn't catch Alix on the League, checkout this cover from issue #24 of weekly series 52, to see the bunch of ragtags Firestorm assembled to fill in when the real JLA went for a dive. What rare characters would you like to see get some light in 2010? I'm with you on the Doctor Fate call. DC is looking pretty silly right now by not having some Dr. Faqte related product on the shelves folloiwng the massive amount of exposure the character got on Smallville. 1. Gorilla City. It's a proven fact that gorillas (apes and monkeys) sell comics. Gorilla City is the most unique setting in comics today, yet DC has never even tried to give the city a chance in the spotlight. It doesn't need to be a full-fledged series, but the awesome apes deserve some love other than the brow-beating Grodd gets every time he shows up. 2. Firehawk. One of the strongest personalities in DC comics in the 1980s this is a character that would have no problem supporting a series. Give it to a high-profile artist who wants to do more writing. Sold. 3. Power Company. They got a brief appearance in yesterday's JLA #42, but they deserve more. Busiek and Grummett need to give it another go and DC needs to step out of the way. Given that the DP is currently being published, I've little room for whining, but these concepts would make me a happier reader. Ya' know - that's made me want to open up my old Power Company issues for another read. Grummett is one of the most unsung artists around I reckon. Anything that gets him more exposure is a good move!